Our dental health, along with our overall health, is extremely important to maintain. We’ve all heard our dentists say, “Brush and floss twice a day and use mouthwash to keep your mouth healthy.” While these tips should be an important part of your daily routine, there are other things you can do to keep your teeth strong and healthy as well, including watching what you eat. Maintaining a healthy and balanced diet can keep our bodies fit and functioning, allowing us to live long lives and experience fewer illnesses. While many foods possess vitamins and minerals that keep our bodies going, five foods in particular have been found to keep our mouths and teeth fresh and white throughout the day. Milk: Dairy products such as milk contain calcium and vitamin D that can keep our teeth strong and white, as well as maintaining the strength of our jaw bones. Lactose intolerant? Soy milk, almond milk and rice milk all contain calcium and vitamin D to do right by your smile. 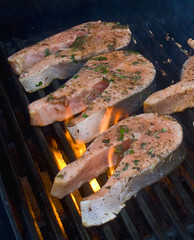 Wild Salmon: While it might seem like a strange food choice to keep teeth looking white and healthy, wild salmon is rich in vitamin D, an essential vitamin in keeping your teeth healthy. Broccoli: It is always important to eat your leafy greens, but broccoli is also an excellent source of calcium, believe it or not. If you are not a dairy fan, this would be a great addition to your diet while keeping your smile sparkling. Broccoli also contains vitamin C, adding to your dental health by helping to prevent gum disease. Bell Peppers: All the colors of bell peppers are a great way to keep your body healthy and your gums free from periodontal disease. Eat a bell pepper raw also adds an advantage of scrubbing around and in between the teeth, removing some plaque that you may have accumulated during the day. Unsweetened Green Tea: Drinking a warm or cold cup of unsweetened green tea can wash away any food that you might have eaten during the day. It can also help prevent periodontal disease by the use of the tea’s antioxidants. There are several other foods that may provide better dental health for your teeth and gums. Raw onions have been said to kill some of the harmful bacteria that reside in the mouth, while eating celery can massage the gums while creating more saliva in the mouth, also killing harmful bacteria that cause gum disease. While eating right and drinking plenty of water can certainly assist in your dental health, it is always important to visit your Austin dentist to ensure that your mouth continues to stay healthy. Make your annual dental appointment with Dr. Matthews by calling or emailing his dental office in Austin today. Can Your Taste Buds Get Infected? Adults Need the Dentist, Too!